If you are a blackjack player you must have heard the name Ken Uston. He became successful in playing blackjack and made a name during his time. This man has won lots of blackjack tables and acquired millions of dollars using his own way of playing cards. Aside from that, he is also the author of famous book Million Dollar Blackjack which is a perfect guide for playing blackjack. This book has made him even more popular than after publishing his first book The Big Player. Ken Uston was born in New York City and he got his MBS at Harvard University. Ken used to play blackjack in different casinos at weekends and each free day he had. He was very inclined in this game. He met a lot professional players who also were considered as great gamblers during their times such as Al Francesco who is known for his blackjack team. Ken joined his team and start playing serious blackjack. It was in 1978 when he moved in another country were new casinos during that time were discovered, he is also responsible in organizing a team of blackjack players as well. It’s just so sad that he and his team were not allowed to enter some casinos as they have been caught while performing their gambling scheme at casino. However, he made a move by suing some of the casinos. The court was on Uston side and it appeared that casinos had no right to ban Ken and his team as they used only their natural mental abilities during the game. Nevertheless, Uston start playing blackjack using diverse identities. He is known as master of disguises and it helped him earned lots of money by playing in different casinos. This man has been playing blackjack for many years. He wrote his very own book and this booked was considered as bible for all card counters. This guide has been sold in 100,000 copies since it was first published during 1981. This book is world-renowned as the most informative book about card counting. Reading Million Dollar Blackjack book, you will find diverse card counting methods and you will learn the famous Advanced Plus Minus Count strategy and Advanced Point Count method developed by Uston. These two methods can help a lot of players in managing their finances and in maximizing their profits. There are flashcards to help readers understand and apply different car counting methods. After that, flashcards has been the best tool for players to practice and learn everything about card counting. Today, you can buy flashcards alone. Aside from learning practical knowledge on card counting, you will also find out exciting history of blackjack. You will learn many things using this book as Uston shares his personal experiences as well as knowledge in card counting. He also shares some of his secrets with dealers, beginners, pit bosses, casino owners and other players. Although this book has been released in the past, it is still a worthwhile book to buy. You can still buy a copy of this book through different online websites and even in traditional book stores. Just search for different sites that sell this book and compared each one of them to find out which one can offer the best price. 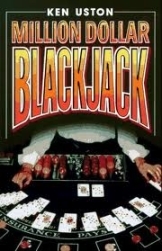 This book will make you a successful blackjack player and will help you win big in different casinos whether land based or online.